Every now and then, life throws up some extraordinary surprises! 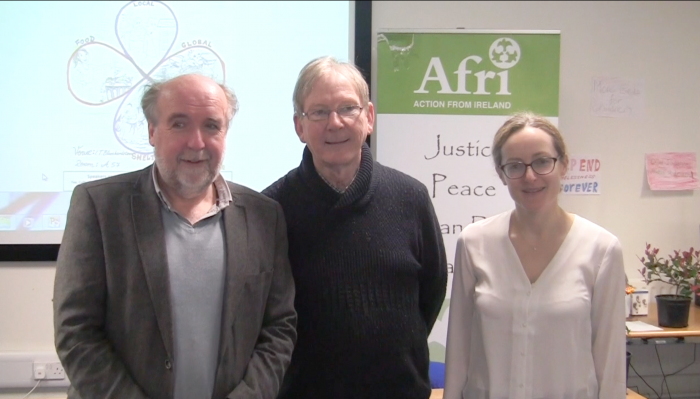 Such a moment occurred during Afri’s annual Hedge School in IT Blancharstown in November in the context of Michael Doorly’s explanation of the origins of Concern. Concern was founded in response to the Biafran War, following a series of meetings in the kitchen of John and Kay O’ Loughlin Kennedy. The new organisation’s first act was to send three ships loaded with food to the beleaguered people, caught up in the war and the poverty and hunger, which it exacerbated. When Michael had finished his presentation, Philip Uzomo stood up and identified himself as a survivor of the Biafran war and said that he’d been a recipient of the food sent on those very ships! This was but one of many memorable moments during Hedge School 2017, many of which were created by the students who embraced the Hedge School idea with gusto and great creativity. We had music, drama, film making and some great singing with an Irish, African and international flavour. Michael Doorly’s contribution was followed by Claire Devlin from Christian Aid who spoke on ‘understanding the links between climate change and violent conflict’. She explored how violence and war affects climate change by weakening societal structures; diverting humanitarian responses away from the basic needs of people and by increasing deforestation and environmental destruction. Among the most moving presentations was a drama on homelessness acted out by a group of students. The dramatic piece was based on the real life experience of a homeless person in Dublin. In a deeply personal and political presentation, Ciaron O’Reilly talked about the urgent need to put a spoke in the wheels of the spiralling war machine. The masters of war know that if you want to maintain an empire of global exploitation you must prepare for and be prepared to go to war. The success of the day was captured by one of the students who took part: “today, I was really inspired to be an activist”, he said.